PRINCE CLUB - SATURDAY FREEZE OUT 2000 GARANTITO ! 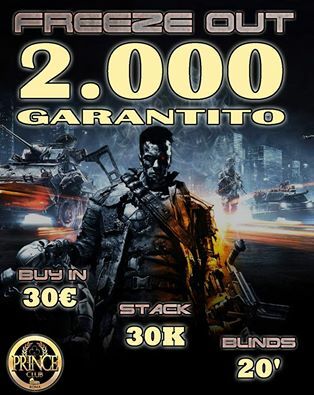 - Texas Holdem Poker - Tornei Live di Poker a Roma. PRINCE CLUB - SATURDAY FREEZE OUT 2000 GARANTITO ! TORNA A ROMA IL VERO POKER, SENZA RE ENTRY E SENZA ADD ON, FREEZE OUT , TECNICO , CON UNA STRUTTURA AD ALTISSIMA GIOCABILITA. SI INIZIERA' DA BLIND 25/50 E LA STRUTTURA PREVEDE TUTTI GLI INTERMEDI.TUTTO CIO' IN UN SOLO TORNEO, METTITI ALLA PROVA...SOLO PER VERI GIOCATORI!